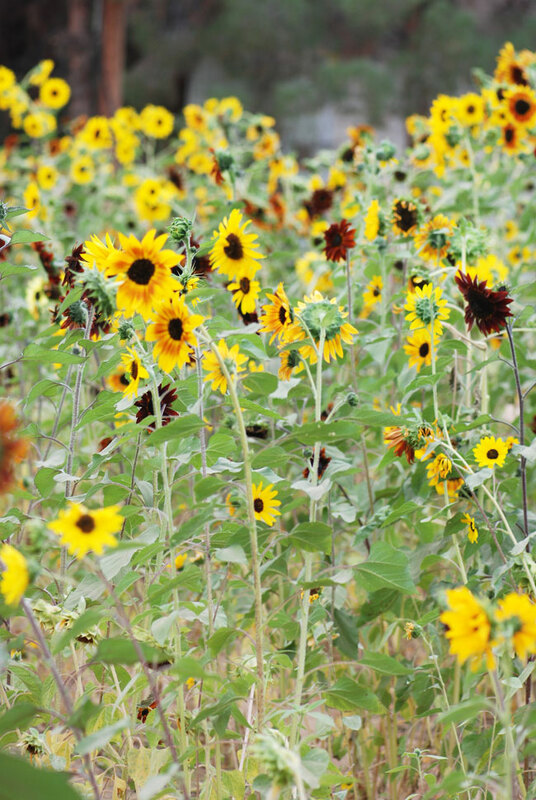 As I pointed out in one of my other blogs, I recently went to a u-pick farm. But instead of vegetables, I brought home photographs. 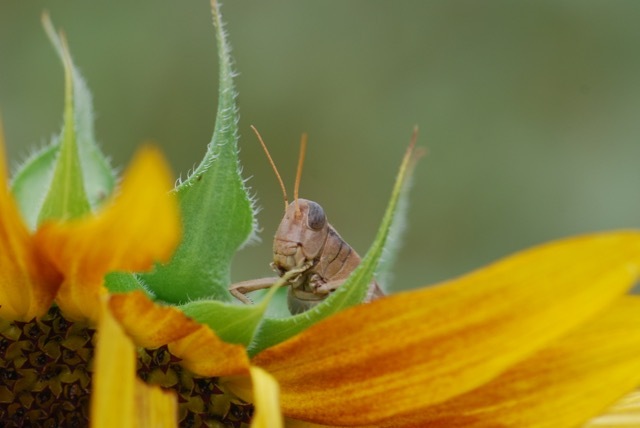 But of course, I spotted the grasshopper. Wait, why does it have its left antenna down? 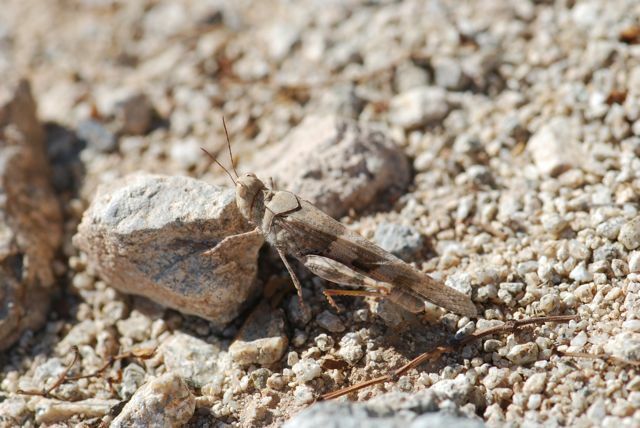 In the previous photograph the antennae were up. Oh. It's walking forward. Where is it going? 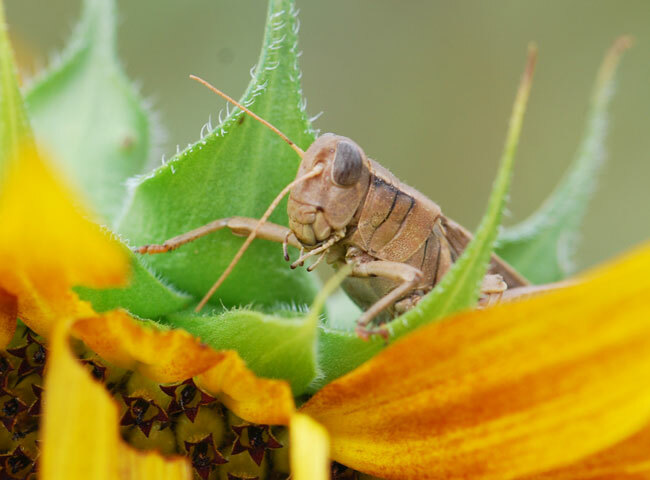 Perhaps it's going to continue snacking on the sunflower petals, because that seems to be where its left antenna is aimed. 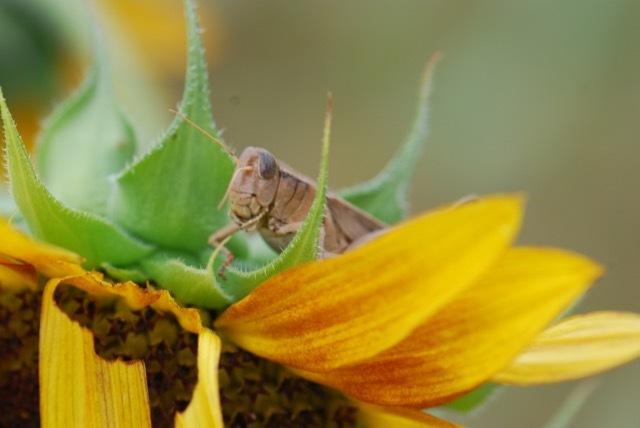 Who knew grasshoppers used their antennae for GPS? Let's take a look at a couple of photographs sent in by my cousin. 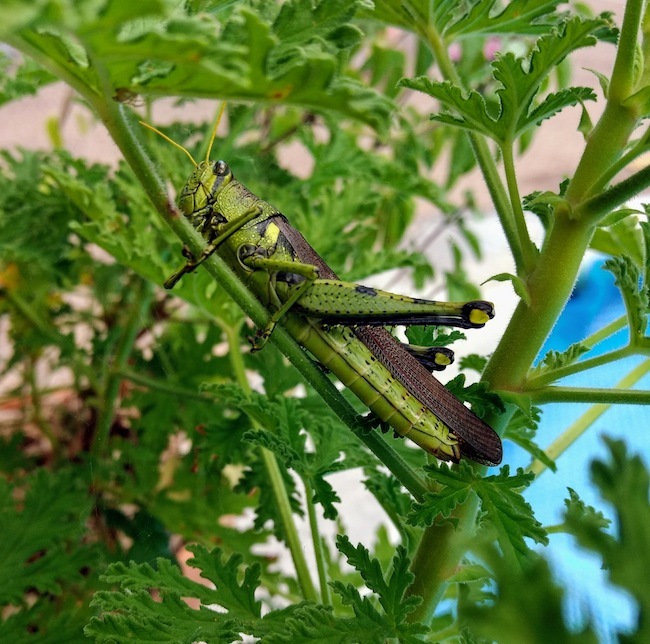 How did she ever spot this mostly green grasshopper hiding on a green plant? Looks a lot different close up! Can you see the bright yellow semi-lunar process at the "knee joint" of the hind legs? 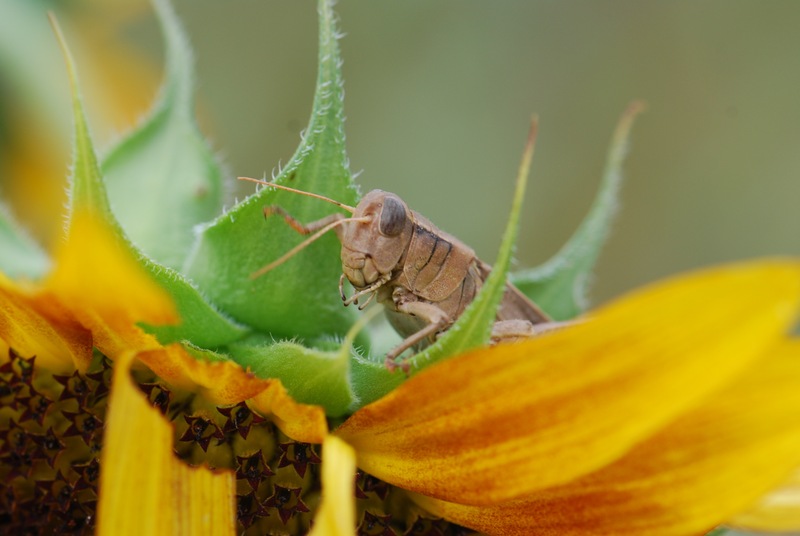 (See previous post about grasshoppers for details). 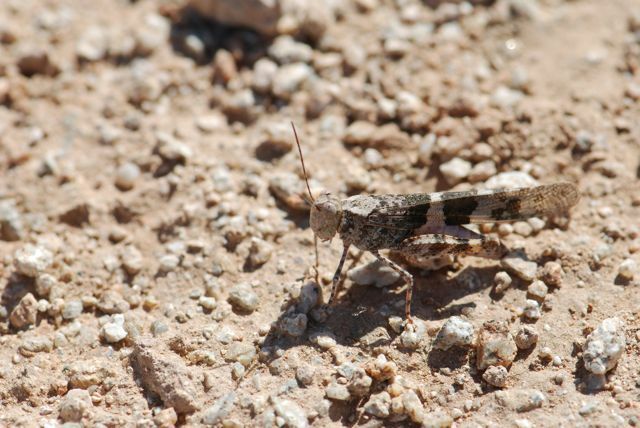 This species has an unusual common name: obscure bird grasshopper, Schistocerca obscura. Turns out the plant is unusual, too. Called the citronella plant or mosquito plant geranium, Pelargonium citrosum, it is a scented geranium that smells like another plant, citronella. Citronella is supposed to chase away mosquitoes, although there's some question whether the scented geranium has the same effect. 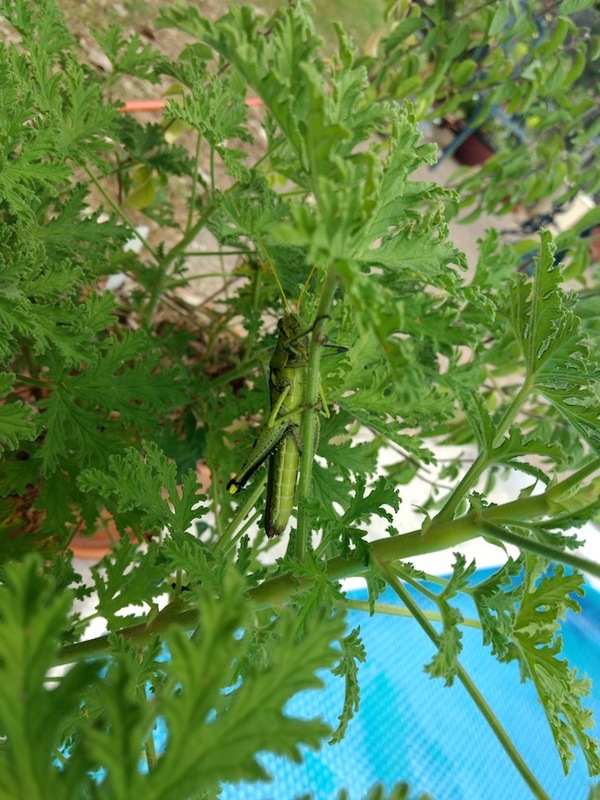 In any case, a scented geranium that smells like citronella evidently does not chase away grasshoppers. Thanks to Karen for permission to use her photographs.